Proud: Justice Graeme Crow (second from left) pictured with niece Grace Crow, a Year 9 student at The Cathedral College, Rockhampton, Rockhampton Bishop Michael McCarthy, and judge’s associate and former TCC captain Dominic Jorgensen at Justice Crow’s welcome to the Supreme Court recently. A PAST student of Rockhampton’s Emmaus College was recently appointed Central Queensland’s first born and bred Supreme Court Justice replacing outgoing Central Judge, Justice Duncan McMeekin. Justice McMeekin welcomed Graeme Crow as his successor at the Rockhampton Court House, witnessed by members of the Crown, the Bar and the Central Queensland Law Association. Rockhampton Bishop Michael McCarthy also attended with Justice Crow’s family representatives. Justice Crow is a member of Rockhampton South parish and completed his primary schooling at St Joseph’s Primary School, Wandal, before moving to St Joseph’s Christian Brothers College then on to Emmaus College, graduating in 1984. After Justice McMeekin’s introductory remarks Justice Crow said his Catholic education had been of the highest standard. Justice Crow has practised in personal injury, commercial and estate litigation for 26 years, bringing a wealth of experience to his new role. After completing a Bachelor of Laws (1989) and a Bachelor of Commerce Justice Crow began practise as a barrister in Rockhampton in 1991. He was appointed Senior Counsel in 2010, again making history as the first barrister born, raised, educated and practising in Rockhampton. 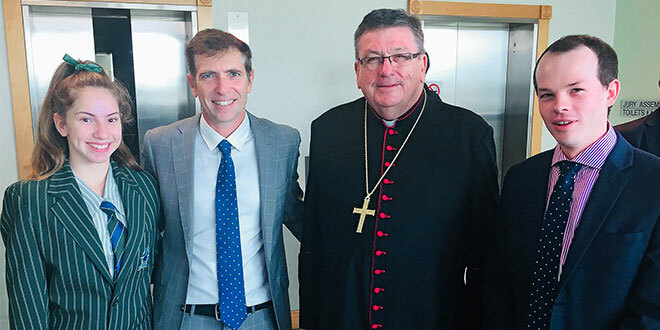 In another Catholic education connection, Dominic Jorgensen, who was captain of The Cathedral College, Rockhampton, in 2011, is serving as judge’s associate to Justice Crow.